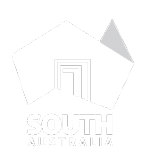 South Australian vineyard owners have much to thank the pioneering wine families of the 1800s for, including their vision to establish quarantine systems to prevent phylloxera entering South Australia. 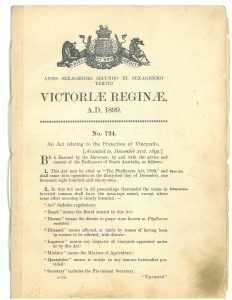 The Phylloxera Act 1899, established the Phylloxera and Grape Industry Board of South Australia, a statutory authority dedicated to the protection of vineyards from phylloxera infestation. The Phylloxera Board – now trading as Vinehealth Australia – has provided 118 years of continuous service. Every vineyard owner with 0.5 hectares or more under vine in South Australia (approximately 3,360) makes an annual contribution of $9.50 per hectare (minimum of $50) to enable Vinehealth Australia to perform its functions under the Phylloxera and Grape Industry Act 1995 (Act). Through Vinehealth Australia, South Australian vineyard owners invest in biosecurity training and awareness, policy and procedures, research and development priority setting, and preparedness, prevention and response activities, to the benefit of the state and national wine industry. The name change of the organisation to Vinehealth Australia in 2015 was recognition of the increasingly complex and rapidly evolving biosecurity landscape. Vinehealth Australia cannot fulfil its mandate of protecting South Australian vineyards from pests without working collaboratively with other states and territories across Australia. Vinehealth Australia’s stability through industry funding and leadership, and its proud history and ‘ownership’ by industry, ensures that it will continue to provide an important focus on vine health, biosecurity and awareness of threats to the Australian wine industry, which contributes $40.2 billion in gross output to the Australian economy.